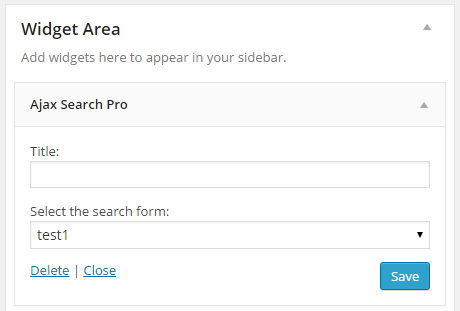 It is possible to add the search to your sites sidebar (or any widgetized area). If you open up the Widgets submenu under the Appearance menu, you should see three new widgets available. You can drag-drop each of these boxes to any available widgetized area. Simply displays the selected search box. Will display the latest (or top) search terms in a box from the search statistics database. Please note, that this widget requires the Search Statistics to be enabled (disabled by default). 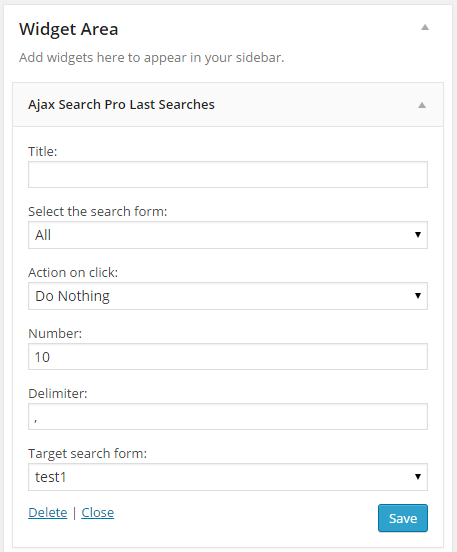 Search statistics can be enabled on the Search statistics submenu under the Ajax Search Pro menu item. Source (Select the search form) - The source of the keywords. Select a search box, or all. Action on click - What to do when the user clicks on one of the words displayed by the widget.